The minimum wage laws in this country are daggers to the heart of opportunity for our poorest and least skilled citizens. Those in favor argue that it helps the poor because they get paid more, and that there is no adverse impact on the economy, overall. I disagree, but want to focus on the very people that the left proposes to help, the unskilled. Take South Africa for instance. The ministry of labor sets minimum wages in various employment areas. But the labor unions in South Africa are closely allied with ruling ANC and they impose wage rates even on non-union sectors of the economy. As a consequence, there is massive unemployment in South Africa amongst the largely unskilled work force, because they are not skilled enough to be affordable to businesses. Another way that minimum wages hit the unskilled is through automation. It is no coincidence that the world leader in viticulture technology is France, where there are high minimum wages. 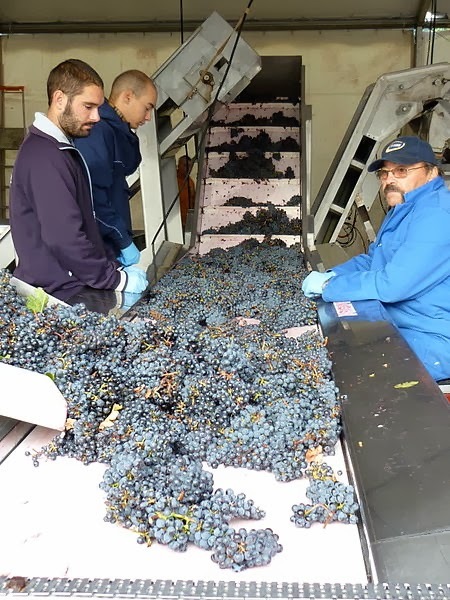 The best robots for picking and sorting grapes are used there. I have personally witnessed McDonald’s experiments with outsourcing the person who takes my order to who knows what country. No less an authority on technology than Bill Gates makes this same point, businesses will invest in technology to displace entry level workers as minimum wages rise. We risk having no entry level positions to train up our young people if we continue to boost the minimum wage. The minimum wage isn’t intended for a work force of older workers with families to support. They should be expected to have amassed skills that would allow them to command a higher wage. Product on sale above, replaces French workers pictured here. Source Wiki Media Commons. As a compassionate society, those who need help but only make the minimum wage are helped through programs like Earned Income Credit, food stamps and medicaid. We should carefully craft these programs so that there is an incentive for the working poor to make more money. In other words, benefits should be phased out gradually as income rises. But to impose the burden of helping the working poor on employers is unfair and will only result in more automation and fewer such jobs. Even if the economy overall benefits from the improved efficiency such automation brings, raising the minimum wage will only exacerbate income inequality. Locally, Todd Gloria proposed raising San Diego’s minimum wage to $14.50 an hour. Given that neighboring cities would not be bound by the law, the loss of San Diego jobs, to Poway for instance, is inevitable should this proposal become law. Businesses that can relocate outside city limits will reap a windfall by comparison. It is hard to see how this can help our city. Big corporations such as Petco and Websense have relocated jobs to Texas. Why would San Diegans want to provide more incentives for job losses? This is a major reason why I so vehemently oppose David Alvarez for mayor and support Kevin Faulconer. Alvarez is on the record as supporting minimum wage increases. If he is mayor, there will be no stopping organized labor from prevailing in making San Diego a hostile location to start businesses and create jobs. I admit that I have a personal interest in this issue. My son works at minimum wage as UFCW 135 member and I don’t want him to lose his job. Do we really want a city with far less opportunity for the unskilled and entry level job seekers? I don’t and voted for Kevin Faulconer because of it. Excellent piece, but you need to go back and give it a title! “37319” is the cryptic default for your omission.